Fred Krejci was born April 28, 1902 on a farm in Fillmore County near Exeter, Nebraska, an area where he remained all but one year of his life. He attended school until the eighth grade at which time he left to help out on the family farm when his brother was drafted to serve in World War I. After becoming interested in art as a child, Krejci decided to pursue it as a career. When he was 25, he enrolled in a correspondence course in commercial art. In 1929, he earned his diploma from the Federal School in Minneapolis, Minnesota, followed in 1930 when he attended the Omaha Art School in Nebraska studying with Wayne Wilson and J. Laurie Wallace. Although unable to be a full-time artist because of the Great Depression, he farmed in Fillmore County and painted in his free time. In 1934, after his art and photography instruction in Omaha, he opened his own photography studio in Geneva, Nebraska. 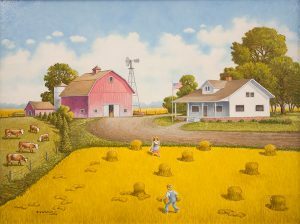 He also experimented with painting rural scenes that were based on his childhood memories. In 1946, he entered one of his oil paintings in an art contest sponsored by the Omaha World-Herald newspaper. The winner was to receive a $10 prize and have his or her work printed on the cover of the Sunday World-Herald Magazine. The newspaper liked Krejci’s work so much that he not only won the contest, but was commissioned to do an additional 32 covers for the publication between 1946 and 1963. In 1979 he received a Purchase Award from the Association of Nebraska Art Clubs. Fred Krejci died in Friend, Nebraska in 1982. The Museum of Nebraska Art has one work by Fred Krejci.